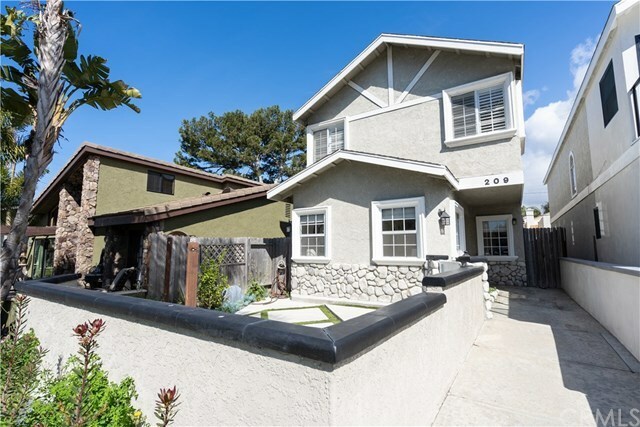 This absolutely stunning downtown Huntington Beach home has been remodeled to add a studio suite over the garage. Located in the Hub of Surf City, just a few short blocks to Pacific City, Main Street HB and the Beach. With 2 outdoor living spaces, a front patio and back patio, it is perfect for all types of entertaining. This home has newer faux-wood tile floors throughout, generous sized rooms and a cozy living room looking out over the front patio. The remodeled kitchen features marbled quartz counters, glass tile back splashes, white cabinets and stainless-steel appliances. The family room is open to the kitchen with a redesigned fireplace and desk area. Other features include recessed lighting, a built-in speaker system, second level skylights allowing for an abundance of light, a whole house water filtration system and an outdoor shower area. The 2nd floor boasts 2 guest bedrooms sharing one brand new bath and an oversized master suite with a walk-in closet & remodeled master bath. Soak in the jetted tub and rinse off in the oversized shower. The dual sink vanity finishes off this room to perfection. A covered walkway off the master suite leads to a relaxing retreat/studio which has its own entrance from the patio below and multipurpose uses such as for teens, a mother in law or as a rental (add a small kitchenette and it is rental ready). Welcome to Surf City â live in luxury and we promise you will never lack for something to do and a place to relax and call home.